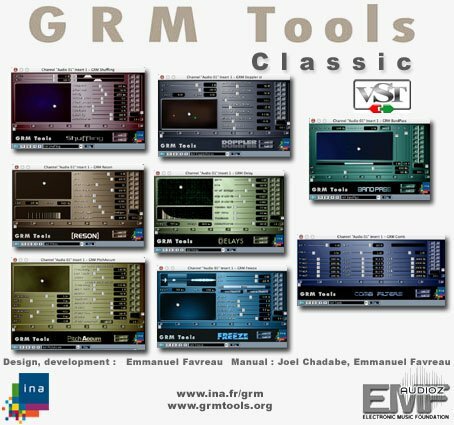 GRM Tools Classic VST is a bundle of eight plug-ins that provide superb tools for sound enhancement and design. Conceived and realized by the Groupe de Recherches Musicales (Musical Research Group) of the National Audiovisual Institute, Paris, France, GRM Tools is the result of more than 20 years of research and development by composers and sound designers in sound transformation software. Use these plug-ins with Cubase or any other version of a PC program that is compatible with VST plug -ins. NOT working correctly on Reaper 5.965 x64 (Bridge), the UI is quite laggy (it doesn't allow click and drag), but the the plugin per se works, beware of this problem. an old classic capable of different results, thanks. It's an updated version, released a year later. I haven't tested the other release so I can't tell which is the best to use, but I noticed that I had a newer version, so I uploaded it. There were also another one from RADiUM but I don't see it, it has been blocked? These were absolutely awesome! I still use these on my old XP machine now! Perhaps I've been looking in all the wrong places, but I have yet to come across any other plug-ins that offer similar effects and workflow/GUI. Would really appreciate suggestions if anyone has any? Respect, gratitude & appreciation go a long way. don't leave home without these plugins!! and i feel lucky to have been able to purchase the complete ii v3 bundle for $270 a few years ago during a crazy black friday sale(i've never seen them that cheap before or since!). but sadly the ilok license is only for one pc.. GRM so strict! Wonder how they are currently?